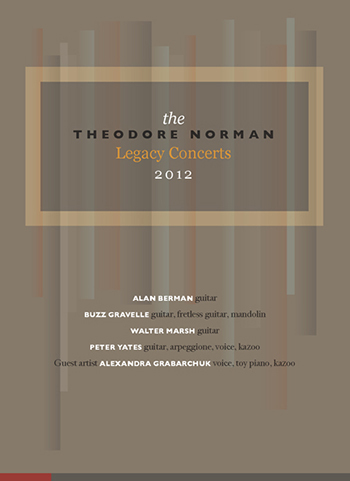 DVD of video selections from the 2012 Theodore Norman Legacy Concerts, performed in Los Angeles on the 100th anniversary of the noted Los Angeles composer/guitarist's birth. In HD and high-resolution stereo audio. Performers: Alan Berman (guitar), Buzz Gravelle (guitar, mandolin), Walter Marsh (guitar), Peter Yates (guitar, arpeggione, voice, kazoo, percussion); Alexandra Grabarchuk (voice, toy piano, kazoo).